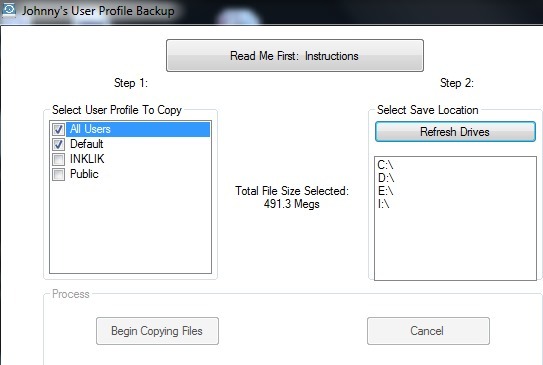 Johnny’s User Profile Backup is a free backup software that helps to automatically backup user profiles and all the important data associated with that. User profile contains desktop items, music files, documents folder, Favorites folder, etc., and can be backed up easily with this freeware. Manually it can take some time as you need to find those profiles for backup. But with this free backup software, only a few mouse clicks are needed to backup your profile. You can either backup all users profile, or can select only a single user’s profile. Profiles can be saved to external drive or any other location on your PC. In screenshot below, you can see its simple interface where you can perform backup task. Unlike other backup software, you can’t backup files & folders available in other hard disks. But it is very helpful to backup user profiles that can be restored easily, when Windows crashes. Check these freeware that help to backup browsers data. A helpful software that can easily backup profile of all users you have created on your PC. Few mouse clicks are needed to backup all profiles. All Favorite folders, desktop items, Documents, Pictures, Videos etc. of any user can be backed up easily. It is only 2.38 MB in size and completely free. How To Backup User Profiles With This Free Data Backup Software? Download Johnny’s User Profile Backup software and install it on your PC. You can use the download link available at the end of this review to download it. Its installation is very simple as you only have to follow as usual installation steps. Once the installation will be completed, you can open its interface. Its interface is very simple and user-friendly. At the left side, you need to select user profile that you want to backup. And at the right side, you need to select the drive where selected user profile will be backup. It is recommended to choose an external drive for backup. Pendrive or portable drive would be suitable for backup. After selecting the user profile and backup drive, you can hit the backup files button. 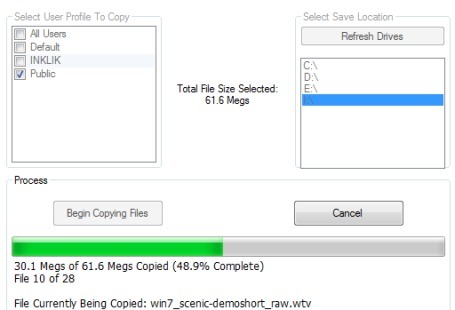 Depending on the selected user profile and files size, backup will be finished. Get Johnny’s User Profile Backup free. You may also try these software that allows to backup files, folders, and helps to schedule backup: GoPC Backup, Backup Master, and Cyotek CopyTools.